Fished a double yesterday. 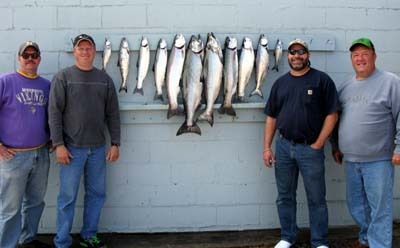 We fished southwest of Ludington both trips. We started out in 120 feet of water (fow) and headed out on a 240 troll. 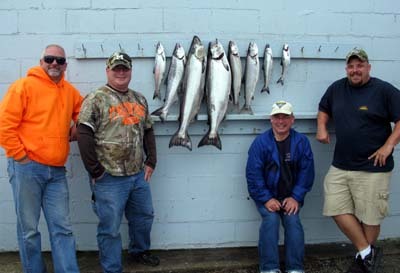 We hit 4 mature Kings at first light and then just picked the rest of the morning. We fished out to the 37’s then turned back in and trolled in to the 35’s. We spent most of our morning fishing between those numbers and had a good catch. Not hearing of anything better we headed back out to the same area for our afternoon trip. The action had definitely slowed. We didn’t have a bite for the first 2 hours of the trip. We finally got some action out in the 39’s and boated 3 fish. We went back to basically the same area this morning but started out deeper, 150 feet and trolled southwest. 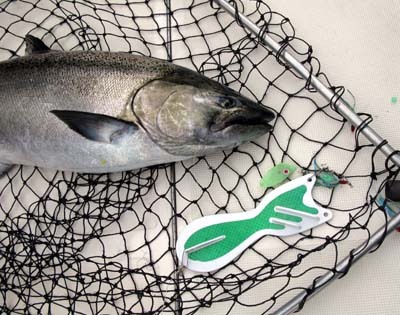 We hit a few fish at first light on 10″ Spin Doctors and Big Water Meat Rigs. 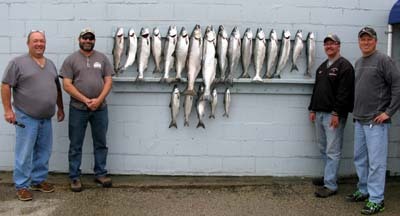 Our best was a 10″ Margarita Spin Doctor/Green UV Big Water Meat Rig with Erie Dearie Meat on a high wire diver out 120 ft. Our out downs were set at 50 and 40 feet with a pair of glow spoons on one and a pair of regular size Dreamweaver Beefeaters on the other. They both took several fish. Another hot rod was a 200 copper with a Super Slim Riverside spoon. We trolled all the way out to 430 fow and had action all the way. We have doubles the next 2 days so I probably won’t have another report up until Saturday. The strong winds from the last two days have scattered the fish again. We fished southwest of Ludington today setting up in the low 55’s and middle of the 36’s. Our first fish came on a high wire diver out 110 on a regular size Dreamweaver Green Glow Spoon. It was a good size King. We trolled out to the 40 line but didn’t have a bite past the 38’s. We ended up catching our fish mostly between the 35’s & 37’s west and 53 to 51 north. The waves were 3 to 4 feet and it was hard to get a good troll. A Super Slim Modified Blue Dolphin on a 150 copper took 2 Lakers. Our biggest King came on a 10″ Spin Doctor and home made Pickled Sunshine Meat Rig we obtained from Team Early Bird in the Ludington tournament. That rig (pictured right) went twice on the morning trip and twice on our afternoon trip. The waves kept building all day and we didn’t think we get our afternoon trip in. Despite being advised of the slow fishing and big waves our afternoon crew wanted to go. So we loaded up and headed north. We set up in 120 feet of water (fow) off the bank and trolled north. The strong west wind made if difficult to stay on the bank, but we did the best we could. 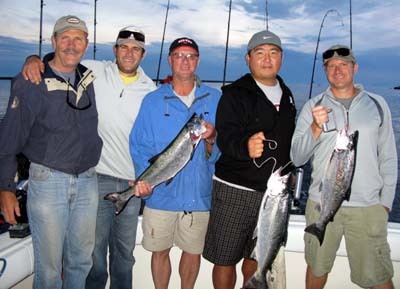 Our crew was tough and we managed to land 4 fish. We had 6 bites and the youngest crew member (pictured below) landed 2 of the 4 fish we caught.